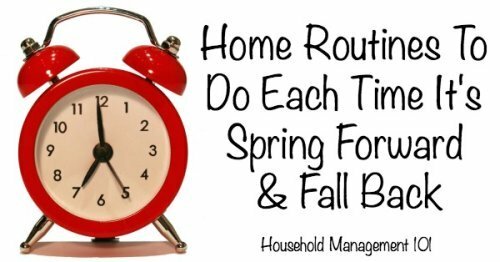 The spring forward fall back biannual event changes the time forward or back an hour, but you can also use the event to remember to do certain chores around your home. The second Sunday in March, at 2 a.m., is the beginning of Daylight Saving Time in the United States*, and that is when people "spring forward." That means people move their clocks ahead one hour, and "lose" an hour. Then, on the first Sunday of November, at 2 a.m., in the United States, is the end of Daylight Saving Time for the year, and that is when people "fall back." This means that people move their clocks back one hour and "gain" an hour. 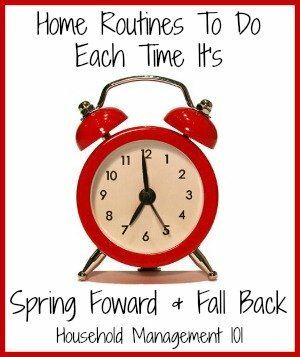 I'm personally not an early riser by nature, so I love fall back and hate spring forward, but either way it becomes the new normal pretty fast. 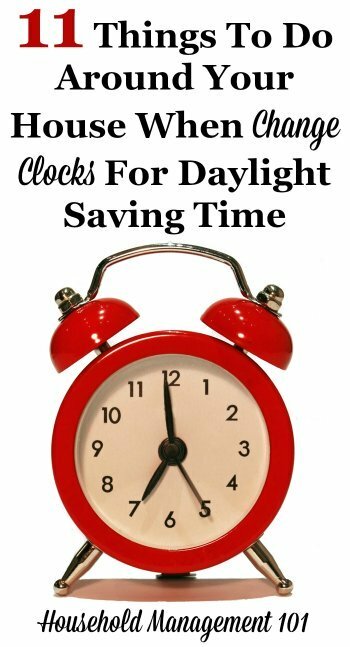 * Generally Daylight Saving Time is observed in most of the United States, with a few notable exceptions including Arizona, Hawaii, Puerto Rico, U.S. Virgin Islands and American Samoa. As you can see from the dates listed above we're about to change our clocks again. When that happens I personally have a couple of other routines I also try to do at the same time, just as a way to remember some things that I don't need to do very often, but do need to get done around the house. Rotate your wardrobe for new season, either warmer clothes in the fall or cooler clothes in the spring. 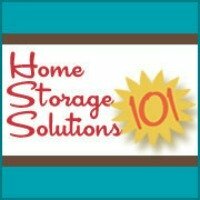 Use this as an opportunity to also declutter clothes you no longer like, fit into, or are stained or damaged. The reason that these set dates are such a good time to do these chores is because it comes during a change of seasons, when several things need to be done around your house. Further, these types of routine things that don't occur at least monthly can be difficult to remember in general, and also to remember when you did it last. A set time every year can help jog your memory, making the task easier for you to recall. So this year try doing some of these additional steps when you are going around to each room of your house (and don't forget your car!) changing your clocks.